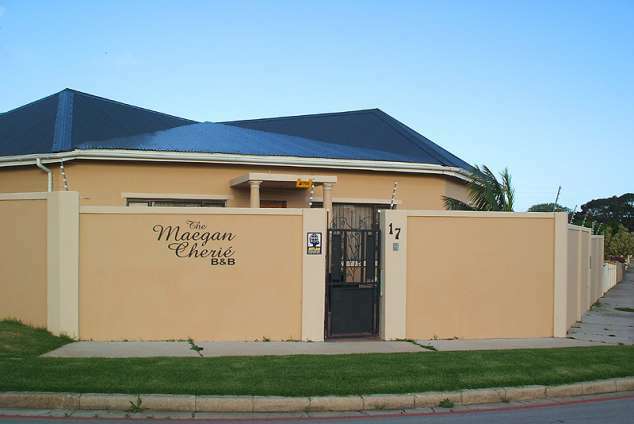 The Maegan Cherie B&B - Walmer Accommodation. 2/14 - Seating ans Reception. 3/14 - Dining Room and Bar. 5/14 - Suite 5 as a King Bed. 14/14 - Entrance to suite 3. Al rooms have private entrance. 2 rooms have double beds and 3 rooms have tin beds which can be converted to King beds on request for an additional fee. The King beds are not offered for stays shorter than 3 nights. Room facilities consist of, flat screen TV, SABC channels and 2 DSTv channels. Free WIFI. Complimentary Tea /Coffee facilities. All rooms are equipped with individual alarm systems to protect guest’s property when not occupied. Hairdryers and Irons available on request. The Port Elizabeth Airport is less than 3 KMs away, Main beaches are 4 KMs, the CBD is 3KMs. There are various restaurants within safe walking distance as well as bowling and tennis facilities in the historic Victoria Park grounds. There are 5 golf courses within a 10 KM radius including the world famous Humewood Links. The Boardwalk Casino Complex is 5KMs. Major shopping centres are 10 minute’s drive, smaller centers are within 2 KMs. There are many Safari parks within 45 minutes' drive including Shamwari, Addo elephant park and many, many others. Airport transfer can be arranged on request. Trips can be organized on request. 823 page views since 13 Sep, 2016. Last updated on 22 Feb, 2018.